It’s cliché and I hesitate to use it, but yes, time really does fly. It feels like my oldest child and her friends were just celebrating their Chief Kanim Middle School graduation. Seriously. That feels like just yesterday. Now these kids are pushing toward high school graduation. Yesterday marked the start of the last semester of high school for the Mount Si Class of 2013. But the school halls were short one friend and classmate, Cameron Van Winkle, whose college career begins in March. Cameron is a young man with a plan. 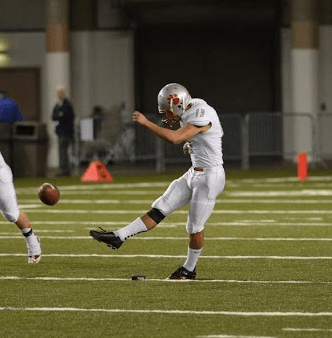 Mount Si’s record-setting kicker has had his college plans solidified for over a year, committing to play football for the University of Washington during his junior year. Cameron (also a soccer player) became Mount Si’s starting kicker right out of the gates freshman year and never looked back. He currently holds the state record for most high school career field goals with 39. This year’s many honors include being named to the KingCo 3A All-League Team and the Seattle Times All-State Team. His senior season was also capped off by a Mount Si team best – a trip to the Tacoma Dome for a State Championship semi-final game. But still… no last semester of senior year with his childhood friends? Nope. Cameron decided there was no reason to wait. With enough credits to graduate a semester early, he finished his AP Stats final last week and closed the book on a successful high school career. The importance of starting college early is the ability to participate in UW’s spring football program, which brings with it an increased chance of becoming the starting kicker for the 2013 football season. It’s something Cameron wants. So come March, when most of his friends will start their last quarter of high school, Cameron will move to a dorm on the University of Washington campus and start his first quarter of college, working his way toward a business degree and a starting kicker job. Cameron does say, though, that he’ll be back to Mount Si in June to walk with his classmates in the Class of 2013’s graduation ceremony. Good Luck, Cameron! Some day we can say we knew you when… and in the Valley, when goes way back.